Vote or Vote NONE campaign aims and summary. 1. Engage the UK's 'Unheard Third' in positive action to improve UK politics and the quality of elected MPs, rather than passive abstention and despair. - by raising awareness of the option to Vote, or Vote NONE in protest. There's no reason to be silent and every reason to think how best to participate. 2. Make visible that our governments are elected from the support of less than a quarter of registered voters. So challenge the defeatist idea of the 'wasted vote' by pointing to the potential impact if just some of the 'Unheard Third' either Vote, or Vote NONE. - including by encouraging the media to show the full and real results of previous elections. 3. Establish the right to protest within our democracy, as a vital part of the democratic process, and as a healthy barometer of political dissent. - by making votes for NONE clear, so that it is indefensible for the Electoral Commission to continue to classify protest votes as 'voter intention uncertain'. 4. Help to take back the word 'politics' from its current negative use, to being what ordinary people do positively in voting, in demons­trating and in daily life, to gain justice and improve our society, economy and environment. When over a third do not vote, and when current research shows that 77% of UK registered voters are dissatisfied with the state of UK democracy, there has to be a way of saying 'No', as well as 'Yes', to what is on offer. The option to protest within our democratic process is a first step to revitalising our democracy and fixing UK politics. Whereas not voting requires no thinking, discussion or participation, the option to Vote NONE is about democracy, and demands all three. Suddenly there's no reason to be silent. 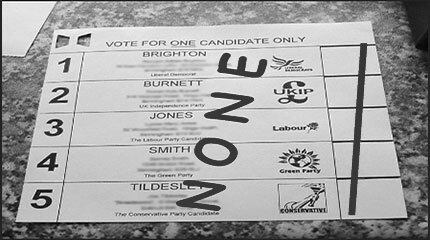 The option to Vote NONE builds positive, active politics from passive abstention and despair. Yet the Electoral Commission currently advises that protest votes be classified as 'Voter intention uncertain'. It deliberately silences democratic protest in the UK. This campaign is therefore about making protest votes clear beyond dispute, to make this process indefensible, and so end this scandal in UK democracy. Revise your advice to Returning Officers. The clear votes for NONE in 2015 have now made it indefensible for you to continue to advise Returning Officers to dismiss protest votes as 'voter intention uncertain'. The clear votes for NONE in 2015 made it indefensible for you to delete those protest votes from your reporting of the election. In 2015, as before, you even reported the results for candidates who received fewer votes than the number of 'spoilt ballots', yet ignored the 'spoilt ballots'. That appears to breach your responsibility to inform and educate, and your vital democratic role in reporting UK election results. When voters see the full results of an election, in their constituency and nationally, they can see there is some point in voting. They can see that votes make a difference, and there's no such thing as a 'wasted vote'. Your current reporting plays a key role in maintaining the sense of defeatism around UK politics. There is no reason to be silent. If just some of the 16 million non-voters Vote, anything is possible: independent-minded candidates and the smaller parties can win seats and have a real influence. If the non-voters Vote NONE, then the protest for change will be larger than the vote for the government. It will be far larger than any street demonstration. Politics is about values. So every day that politicians sneer at the other parties, misrepresent their policies and record, and make personal character assassina­tions, it discredits your party, UK politics and democracy. So have respect for those who want nothing to do with it, yet also want positive change. They are often silenced by the defeatist idea of the 'wasted vote'. If we can act demo­cratically together, we may create hope for our future.